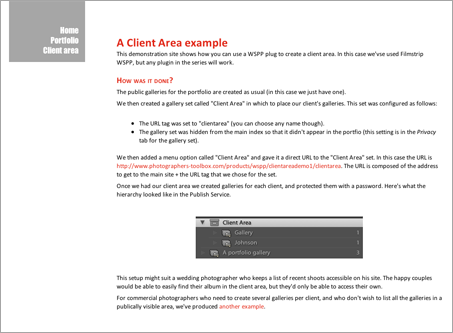 The WSPP series offers two options for private galleries - you may hide them from the gallery index pages or else protect them with a password. Very often you may choose to do both. Password support requires that PHP scripting be offered by your web host, however creation of the PHP scripts is entirely handled by the plugins. Note that you do not need a server side database. 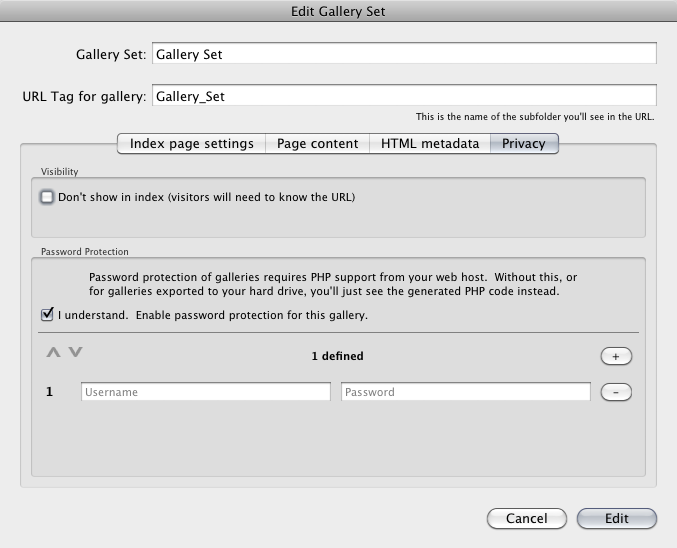 Both the visibility settings and the passwords can be accessed from the "Privacy" tab of the gallery's settings. Passwords may be added to either a single gallery, or an entire set of galleries. Adding passwords to a gallery set is a great way of providing clients with an area in which they can see and access all their galleries at once without the need to repetitively enter a new password each time. Note that passwords added to a set will override any password options that may have previously been added to any child sets or galleries. You can add as many username/password combinations as you wish. This provides you with an easy way to manage access to galleries by multiple parties. Password protected galleries will appear in the gallery index (unless you hide them), however they'll be no thumbnail images (it's meant to be private). By hiding a gallery (or a gallery set) from the index pages you create a private area that isn't seen by casual visitors. To see the gallery you'll need to know the URL (web address). You can also choose to make direct access to the set impossible, so that visitors trying to view the set itself will be redirected to the main page. 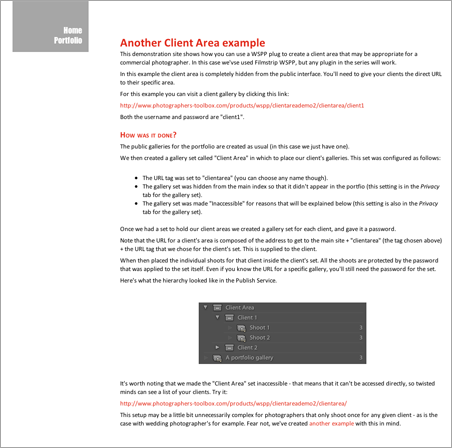 This is a great way of creating a client area, and there are many ways to use the feature. Here we'll discuss two typical configurations. If you typically have a single gallery per client, as may be the case for a wedding photographer, then you could create a single hidden gallery set for all your galleries, give each gallery a password, then send the url for each private gallery to your clients (you'll know the URL path since you can choose the URL tag for each gallery). By placing all the client galleries in a single hidden set you can more easily manage the collections in Lightroom. The hidden set won't appear in the main index, so you can continue to use that as the entry point to your portfolio. When working like this you may choose to make the top level set inaccessible. That way, if the user tries to view the set itelf they won't see a list of the client galleries - instead they'll be redirected to the home page. On the other hand you may prefer to leave the set accessible so that all the clients can see the sub-galleries (one per recent wedding, for example), from which they can find their own. They'll only be able to visit the wedding for which they have a password of course. In this case you could even create a menu link for the cient area, and point it directly at this hidden set. Here's an example gallery that we've put together that shows this situation. The settings we used are discussed on the demonstration site itself. If your work is such that you produce several galleries per client then you may take the previous example one step further by creating a gallery set for each client. By putting a password on the set you can give the client access to all their galleries from one single point. In this case you'll probably prefer to make the top level set inaccessible so that each client can't view a list of all the other client galeries, however you won't want to make the individual sets inaccesible other the client won't be able to see a list of their galleries. Here's an example gallery that we've put together that shows this situation. As before, the settings we used are discussed on the demonstration site itself.